Easy homemade fudge is one of the Boomer Gal's four major food groups. When I was a kid, everybody loved fudge. When I was a kid, every mom made fudge, especially for the holidays. Fudge recipes have changed, but fudge is still fantastic. Who Doesn’t Love Fudge Already? We don’t know for sure who invented fudge, but it’s a given that it was invented here in America. Yes, we know that because, prior to America’s unique early culinary skills, fudge was referred to in dictionary lingo as “to fabricate” or “to bungle” up something, and there is no evidence that there actually was a food-preparation recipe for it in any of the professional confectionery cookbooks. We do know that it was first made and later put up for sale at a senior auction in 1892 at Vassar College. Most historians think it originally came from messing up or “bungling” a batch of caramels in a Lebanon, Pennsylvania candy plant. This created a concoction known as “Opera Fudge.” Let’s face it, food was expensive and hard to come by in those days, so they probably didn’t have the option of wasting any messed up batches of any foodstuffs. 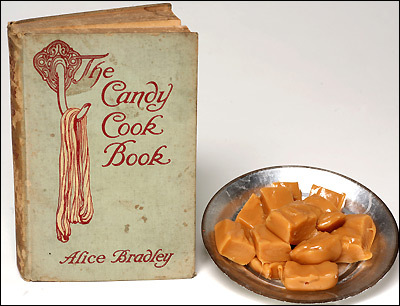 We do know that an early confectionary cookbook The Candy Cook Book by Alice Bradley (1929) devoted a whole chapter to just fudge, so word must have got out and spread fast in those days. Just imagine how good it would have tasted back then. They probably had few sweet pleasures in life and this new fangled fudge candy surely topped their “A” list. It was hard to spend any appreciable time inside during the winter months in the northern part of the United States – in my case Ohio – without either banging the pots in the kitchen to make taffy or to make fudge. We sometimes got the gang together to have a “taffy pull,” but good homemade fudge was the hands-down favorite. Sometimes we wore more of it than we ate and other times we ate so much of it we were in a fudge coma for a week, but either way we were sure happy cabin-fever campers. But, our fudge came out grainy sometimes. Heck, we loved it anyway. Please see Mamie Eisenhower's Fudge recipe on page two. I came to your website looking for a recipe for sugar-free fudge, instead I find the history of fudge. Then you list Mamie's recipe for fudge which is found on every jar of marshmallow cream. Finally, at the end you tell me to use a mix. A mix!?! Seriously. Thank you for wasting my time. I'm sorry about that. I had no idea. I don't cook. I'll ask the author to change the article or I'll take it down... The author is the woman who created the mix. She is the co-owner of the company, so she should be able to tell you how to make the low-carb version from scratch.